This week at the NCWIT Summit, I heard Joshua Aronson speak on stereotype threat. I’ve read (and even taught) about stereotype threat before, but there’s nothing like hearing the stories and descriptions from the guy who co-coined the term. Stereotype threat is “apprehension arising from the awareness of a negative stereotype or personal reputation in a situation where the stereotype or identity is relevant, and thus comparable.” Aaronson has lots of examples. 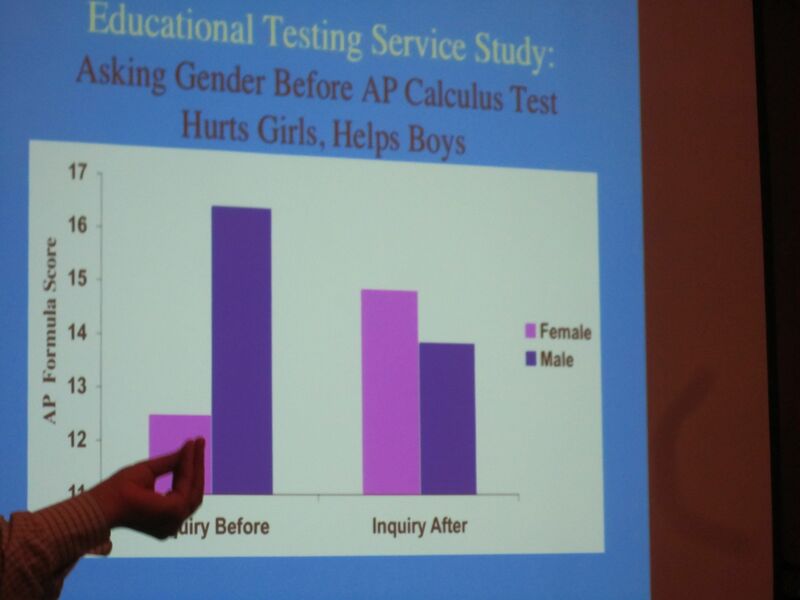 Remind women of the gender (and implicitly, of the stereotype that says women are worse than men at math) and their scores drop on math tests. Remind African Americans of their race (and implicitly, of the stereotype about African Americans and intelligence) and their scores on IQ tests drop. If you ask before, women do much worse than men, as past results have typically shown. If you ask after, the women do better than the men, but the men also do much worse than before! Reminding men of their gender, and the stereotype, improves their performance. Don’t remind them, and they do worse. Which leaves us in a tough position: When should you ask gender? The wonderful thing about research is that you can put questions like this to the test — and we did (Kamins and Dweck, 1999; Mueller and Dweck, 1998). We gave two groups of children problems from an IQ test, and we praised them. We praised the children in one group for their intelligence, telling them, “Wow, that’s a really good score. You must be smart at this.” We praised the children in another group for their effort: “Wow, that’s a really good score. You must have worked really hard.” That’s all we did, but the results were dramatic. We did studies like this with children of different ages and ethnicities from around the country, and the results were the same. Here is what happened with fifth graders. The children praised for their intelligence did not want to learn. When we offered them a challenging task that they could learn from, the majority opted for an easier one, one on which they could avoid making mistakes. The children praised for their effort wanted the task they could learn from. The children praised for their intelligence lost their confidence as soon as the problems got more difficult. Now, as a group, they thought they weren’t smart. They also lost their enjoyment, and, as a result, their performance plummeted. On the other hand, those praised for effort maintained their confidence, their motivation, and their performance. Actually, their performance improved over time such that, by the end, they were performing substantially better than the intelligence-praised children on this IQ test. Joshua Aronson, Catherine Good, and their colleagues had similar findings (Aronson, Fried, and Good, 2002; Good, Aronson, and Inzlicht, 2003). Their studies and ours also found that negatively stereotyped students (such as girls in math, or African-American and Hispanic students in math and verbal areas) showed substantial benefits from being in a growth-mindset workshop. Stereotypes are typically fixed-mindset labels. They imply that the trait or ability in question is fixed and that some groups have it and others don’t. Much of the harm that stereotypes do comes from the fixed-mindset message they send. The growth mindset, while not denying that performance differences might exist, portrays abilities as acquirable and sends a particularly encouraging message to students who have been negatively stereotyped — one that they respond to with renewed motivation and engagement. Dweck is pretty careful in how she talks about intelligence, but some of the others are not She talks about “while not denying that performance differences might exist” and “portrays abilities as acquirable” (emphasis mine). The Dept of Ed report says we should tell students that “intelli­gence is expandable.” Is it? Is intelligence actually malleable? The next workshop I went to after Aronson’s was Christopher Chabris’s on women and the collective intelligence of human groups. Chabris showed fascinating work that the proportion of women in groups raises the collective intelligence of groups. But before he got into his study, he talked about personal and collective intelligence. He quoted Charles Spearman from 1904: “Measurements of cognitive ability tend to correlate positively across individuals.” Virtually all intelligence tests correlate positively, which suggests that they’re measuring the same thing, the same psychological construct. What’s more, Chabris showed us that the variance in intelligence can be explained in terms of physical structures of the brain. Personal intelligence is due to physical brain structures, but we can work collectively to do more and think better. My Georgia Tech colleague, Randy Engle, was interviewed in the NYTimes a few weeks ago, arguing that intelligence is fixed. It’s due to unchanging physical characteristics of the brain. We can’t change it. via Can You Make Yourself Smarter? – NYTimes.com. Is intelligence expandable and malleable, or is it physical and fixed? There is a level where it doesn’t matter. Telling students that intelligence is expandable and malleable does have an effect. It results in higher test scores and better performance. But on the other hand, is it good policy to lie to students, if we’re wrong about the malleability? Maybe we’re talking about different definitions of “intelligence.” Engle and Chabris may be talking about a core aspect of intelligence that is not malleable, and Dweck and Aronson may be talking about knowledge, skills, and even metacognitive skills that can be grown throughout life. But we say that “intelligence” is malleable, and the work in stereotype threat tells us that the language matters. What words we use, and how (and when) we prompt students impacts performance. If we don’t say “intelligence can be grown like a muscle” and instead say, “knowledge and skills are expandable and malleable,” would we still get the same benefits? I’m not a psychologist. When I was an education graduate student, I was told to think about education as “psychology engineering.” Educators take the science of psychology into actual practice to create learning systems and structures. I look to the psychology to figure out how to help students learn. While Dweck and Aronson are explicitly giving educators strategies that really work, I worry about the conflict I see between them and other psychologists in terms of the basic science. Is it a good strategy to get positive learning effects by telling students something that may not be true? Entry filed under: Uncategorized. Tags: BPC, educational psychology, growth mindset, NCWIT, stereotype threat, women in computing. The discussion above is mostly a red herring, and kind of silly in its simple one-dimensionality. A rule of thumb that serves well here is “Ability = Talent + Skill + Will” (and perhaps the operations are more complicated than “+”). If you are much more talented in music than I am but don’t play the keyboards, I will beat you in being able to play Mozart until you put in the work. If you are much more talented in math than I am, I will beat you if you don’t know calculus, etc., until you put in the work. It is likely that there are neurological differences — it would be biologically surprising if there weren’t a spread — but the ones that count are those that enable or prevent the needed skill learning, especially of tools, in a world in which so many subjects are developed subjects which require much more than talent to attain fluency. Jaime Escalante — the great AP calculus teacher in the barrio — always told his classes that the big deal about calculus — and life — was “Ganas”. The translatable part of this term is “Will”, the less translatable part is more like “deep core will”. I’m raising the question in the title because I really don’t know. The growth mindset work is powerful and interesting. Dweck’s characterization seems more careful and truer to what I read elsewhere in psychology. Part of the red herring just has to do with definitions. I used “talent” instead of “intelligence” because it is more simply associated with something innate. I used “skill” for “all things acquired” (including “methods” and “knowledge”, etc.). And “will” stands in for all things motivational. This is too simplistic to be completely real — for example, see the work of the neurophysiologist Changeaux concerning the actual proliferation of new neural material after birth, etc. — but it is good enough for this discussion. A good word for the sum total is “ability”, and this was used by the violin teacher Suzuki for what he was doing with young children: “Ability Training From Age Zero”. As Bettina points out, what you can parlay together matters more than the amounts of the individual parts. I get your point. You’re saying that there certainly is something innate and unchanging, but the parts that are changeable are significant and can (with enough “will” and “skill”) overcome weaknesses in the innate part. So, if “intelligence” is fixed (by some definition), then it’s the wrong word to use when encouraging a growth mindset, but that’s hardly that important. The reality is that the overall outcome can be influenced by factors within our control. My favorite philosopher — Linda Ronstadt — says “All you can do is follow your instincts, and refine your talents to support your instincts”. In sports and the arts most of the matters of technique seem within the range of the will and skill part. And in the ones that are highly developed, even those with great innate abilities have to find will to develop skill. Much less is known (as far as I can tell) about the tradeoffs in matters of “perspective”, “point of view”, “ease with uncertainty and paradox, etc.”. These are critical for “art”, and I think right now are likely to be more influenced by innate factors than learned ones. However, there is no question that some of these can be learned as skills (cf deBono, etc.). I’m guessing that “going against ‘reality’ ” for many human types would be much more painful than the thousands of hours of “simple pain” associated with simple technique learning. If I were a brand new educational researcher I would put a lot of effort into finding and inventing skill learning techniques for epistemological shifts, especially for adults (including college students). Alan Kay said much of what I am thinking better than I could but I have to add my two cents. Intelligence and knowledge are different. While the growth of intelligence may be debatable I don’t think that the growth in knowledge is. In a sense knowledge is a lever that increases what one can do with their intelligence. Knowledge is a force multiplier if you will. Or perhaps intelligence multiplies the value of the knowledge. I’m not sure it matter that much which – it is math after all. 🙂 Education is about increasing knowledge and helping students to leverage the mix of their knowledge and intelligence to the best that they can. The result of the equation matters more than the individual values that feed into it. Agreeing mostly with Alan and Alfred here, but with one difference. There are thinking skills that improve with practice, different from “knowledge”. I see “knowledge” as referring to facts and some organization of them, but not skills like debugging. For a non-CS example, consider the difference between vocabulary (“knowledge”) and reading ability (“skill”). The two are distinct, though there is correlation between them, and both are correlated with intelligence, which is yet another dimension. All tests measure some combination of skill and knowledge, from which we infer intelligence. Thus there is no real way to determine whether or not intelligence can be increased—but it is damn certain that skill and knowledge are both capable of being increased, which looks the same as if intelligence were being increased. Strickler is careful to say that this could be due to the fact that stereotype threat is already activated, since everyone already understands the AP exam as high-stakes. I just can’t find anything that looks like the graph in the photo. Did Aronson give a source? And this is of great concern to ETS — if they knew and could show that their test administration procedures have a discriminatory effect in and of themselves, wouldn’t they then be obligated (and interested) to change the procedure? Aronson mentioned something about a pending legal action involving ETS. I heard that other people got a reference from him, but I didn’t. Sorry! If IQ is “not a thing”, this could account contradictory evidence about it’s “malliability”. “Regular brain training didn’t help people’s cognitive performance at all, yet aging had a profound negative effect on both memory and reasoning abilities,” said Owen. I think that’s what’s meant by “fluid intelligence” — the cognitive performance that doesn’t seem to change. can someone explain to me what carol Dweck means when she says “The growth mindset, while not denying that performance differences might exist, portrays abilities as acquirable and sends a particularly encouraging message to students who have been negatively stereotyped” (page 4 ). She is saying that people with a growth mindset think that they can get better at things (“abilities as acquirable.”). Some people will be better than others due to innate abilities, stuff you’re born with. This should be encouraging even to people who have been stereotyping as being unable to improve their lot in life.